My favorite thing about hats, besides the fact that you only have to style the lower half of your hair if you wear one regularly, is that you can knit one with only one skein. They’re fast projects, so you can make a whole bunch and change your “head sweater” every day if you want. I’m drawn to chunky, textured styles in particular. 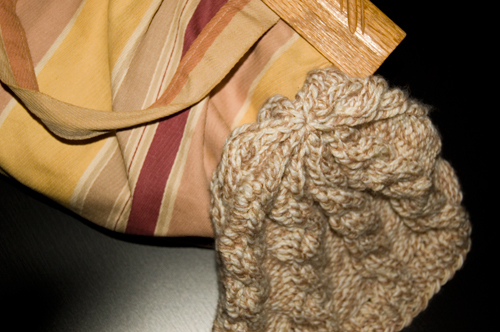 This pattern actually didn’t come from Hattitude; it’s the “Chunky Cable Hat” from Ravelry member Emily Wessel. It was very easy to follow, and a single (size-10.5) DPN made a perfect cable needle. the twist: I did go with a narrow brim (70 stitches around) and a wider body of the hat (80). I had to recalculate the decreasing pattern accordingly, but that wasn’t hard to do, and it gave the hat a big more height.